The Shwedagon Pagoda, officially titled Shwedagon Zedi Daw, also known as the Golden Pagoda, is a 98-metre (approx. 321.5 feet) gilded stupa located in Yangon, Burma. The pagoda lies to the west of Kandawgyi Lake, on Singuttara Hill, thus dominating the skyline of the city. It is the most sacred Buddhist pagoda for the Burmese with relics of the past four Buddhas enshrined within, namely the staff of Kakusandha, the water filter of Konagamana, a piece of the robe of Kassapa and eight hairs of Gautama, the historical Buddha. The origins of Shwedagon are lost in antiquity, its age unknown. Long before the pagoda was built, its location on Singuttara hill was already an ancient sacred site because of the buried relics of the three previous Buddhas. According to one legend, nearly 5000 years had passed since the last Buddha walked the Earth, and Singuttara hill would soon lose its blessedness unless it was reconsecrated with relics of a new Buddha. In order that such new relics might be obtained, King Okkalapa of Suvannabhumi spent much time atop the hill, meditating and praying. A series of miracles ensued and eight hairs of the historical Buddha were, somewhat magically, brought to the hill. To enshrine the relics, multiple pagodas of silver, tin, copper, lead, marble, iron and gold where built one on top of the other to a height of twenty meters. During the following centuries, passing from myth to historical fact, the pagoda grew to its present height of ninety-eight meters. Much of the continued construction of Shwedagon was actually reconstruction following disastrous earthquakes. During the 17th century the pagoda suffered earthquake damage on at least eight occasions. A particularly bad quake in 1786 brought the entire top half of the pagoda to the ground and its current shape and height date from the reconstruction of that time. While much of the pagoda's beauty derives from the complex geometry of its shape and surrounding structures, equally mesmerizing is its golden glow. The lower stupa is plated with 8,688 solid gold bars, an upper part with another 13,153. The tip of the stupa, far too high for the human eye to discern in any detail, is set with 5448 diamonds, 2317 rubies, sapphires, and other gems, 1065 golden bells and, at the very top, a single 76-carat diamond. Surrounding the pagoda are a plentitude of smaller shrines housing pre-Buddhist spirits called Nats, miracle working images, and even a wish granting stone. The entire temple complex radiates a palpable sense of beauty and serenity. The stupa fell into disrepair until the 1300s when the Mon king Binnya U of Bago had the stupa rebuilt to a height of 18 meters (60 ft). It was rebuilt several times and reached its current height of 98 meters (320 ft) in the 15th century. The Mon kingdom possessed two great pagodas of especial sanctity, the Shwemawdaw at Bago and the Shwedagon. Originally only twenty-seven feet high, it was raised to a height of sixty-six feet in 1362 by King Binnya U as an act of special piety. Dhammazedi's immediate predecessor, his mother-in-law Queen Shinsawbu (1453-72), raised its height to 40 meters (129 ft). She terraced the hill on which it stands, paved the top terrace with flagstones, and assigned land and hereditary slaves for its maintenance. When in 1472 she yielded up the throne to Dhammazedi, she retired to Dagon, and during her last illness had her bed placed so that she could rest her dying eyes upon the gilded dome of the sacred fane. The Mon face of the Shwe Dagon inscription catalogues a list of repairs beginning in 1436 and finishing during Dhammazedi's reign. It mentions Queen Shinsawbu under a terrific Pali name of sixty-six letters. By the beginning of the sixteenth century the pagoda had become the most famous place of pilgrimage in Burma. A series of earthquakes during the next centuries caused damage. The worst damage came from a 1768 earthquake that brought down the top of the stupa and it was raised to its current state by King Hsinbyushin (lit. Lord of the White Elephant) of Konbaung Dynasty. A new hti or crown was donated by King Mindon Min in 1871 after the annexation of Lower Burma by the British. An earthquake of moderate intensity in October 1970 put the shaft of the hti visibly out of alignment. A scaffold was erected and extensive repairs to the hti were made. There are four entrances (mouk) to the Paya that lead up a flight of steps to the platform (yin byin) on Singuttara Hill. The eastern and southern approaches have vendors selling books, good luck charms, Buddha images, candles, gold leaf, incense sticks, prayer flags, streamers, miniature umbrellas and flowers. A pair of giant chinthe (leogryphs, mythical lions) guard the entrances and the image in the shrine at the top of the steps from the south is that of the second Buddha, Konagamana. The base or plinth of the stupa is made of bricks covered with gold plates. Above the base are terraces (pyissayan) that only monks and men can access. Next is the bell-shaped part (khaung laung bon) of the stupa. Above that is the turban (baung yit), then the inverted almsbowl (thabeik), inverted and upright lotus petals (kya hmauk kya hlan), the banana bud (nga pyaw bu) and then the crown. The crown or umbrella (hti) is tipped with 5,448 diamonds and 2,317 rubies. The very top, the diamond bud (sein bu) is tipped with a 76 carat (15 g) diamond. The Gold seen on the stupa is made of genuine gold plates, covering the brick structure attached by traditional rivets. 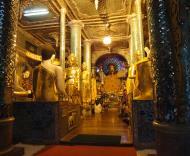 Myanmar people all over the country, as well as monarchs in its history,have donated gold to the pagoda to maintain it. It was started in the 15th century by the Mon Queen Shin Sawbu who gave her weight in gold and continues to this day. Visitors must remove their shoes before the first step at any of the entrances. The southern and eastern approaches have traditional shops with wide gradual staircases. In addition these entrances have an elevator and the infrequently used western one is equipped with escalators. Burmese walk around the stupa clockwise (let ya yit). The day of the week a person is born will determine their planetary post, eight in all as Wednesday is split in two, a.m. and p.m. They are marked by animals that represent the day, galon (garuda) for Sunday (ta nin ganway), tiger for Monday (ta nin la), lion for Tuesday (in ga), tusked elephant for Wednesday a.m.(bouddahu), tuskless elephant for Wednesday p.m. (yahu), mouse for Thursday (kyatha baday), guinea pig for Friday (thaukkya) and naga (mythical dragon/serpent) for Saturday (sanay). Each planetary post has a Buddha image and devotees offer flowers and prayer flags and pour water on the image with a prayer and a wish. At the base of the post behind the image is a guardian angel, and underneath the image can be seen the animal representing the day. The base of the stupa is octagonal and also surrounded by small shrines, eight in number for each day of the week. Most Myanmar people are Buddhist, at the same time believing Astrology which originated from Hindu Brahmanism. Actually Buddha, the awaken one was the son of the King called Suddhodana who was embraced the Brahmanism in his former days before he was in a good faith of Buddhism. So it is no wonder the Burma are still adopting some parts of those old beliefs. It is very important for every Myanmar Buddhist people to recognize the day of their birth, such as Sunday, Monday, Tuesday etc. Otherwise, he or she may not know which part of pagoda platform to go and make special devotional acts either his or her desire or by the advice of Astrologer. Myanmar Astrology recognizes the seven planets, namely Sun, Mon, Mars, Jupiter, Mercury, Venus, and Saturn. In addition, it recognizes two other planets, Rahu and Kate. All the Myanmar names of the planets are borrowed from Hindu Astrology, but the Myanmar Rahu and Kate are different from the Hindu Rahu and Kate. The Myanmar considers them to be distinct and separate planets, whereas Hindu astrology considers them to be either the Dragon's Head and Tails, or Ascending and Descending Nodes. To the Myanmar people, Kate is the king of all planets. As with other Nations the Myanmar name the seven days of their week after the seven planets, but Myanmar astrology recognizes an eight days week, Wednesday being divided into two days; until 6 p.m. it is Wednesday, but after 6.pm. to the midnight it is Rahu's day. The basic belief of Myanmar Astrology is that the planets except the Kate, mould a man's fate. The planet of a man's birthday will be the main guardian of his fate, but at each particular period of a man's life a particular planet throws upon him its baneful or its beneficial influence. For example, at one period of his life he will be under the influence of Saturn and ill-fortune will befall him, but at another period he will be under the influence of Venus and good fortune will result. Thus the ebb and flow of a man's fortune depends on the paths in the sky of the planets. Most Myanmar Buddhist approach an astrologer for something or another, whether to go ahead with a move to a new house or get married or pass exams or doing new business. The astrologer would do some calculations according to the magic formulas he alone knows and arrive at a certain conclusion. The astrologer would sometime say that he or she is under the bad influence of a certain planet and to counter this the clients should go to his or her birthday planetary post and pour a certain number of cups of water or place papier mache umbrellas or flowers etc as a ‘yadaya’ or to put it in English, a symbolic counter to avert the bad influences the subject is under currently or looming in the future by using the inherent powers in his or her offering plus some personal wishes. Or, the symbol of water in conjunction with the symbol of a planetary post will mean that he may send a Wednesday born to pour water at the Saturday corner, and so on. He alone knows the symbols connected to each and he alone can calculate on what day or time to do it, and where. And whoever do not want to avoid misfortune and bad luck just by pouring water at one’s planetary post and ensure one’s peace of mind and end of anxieties? When Myanmar Buddhists go to the pagoda, they know in their hearts that they are treading the noble path to that state where the best of human nature will have a fair chance to manifest it self in deeds of generosity, loving kindness and compassion for one's fellow beings. Visits to pagodas are important to Myanmar Buddhists. The guiding force is faith in the efficacy of one's own karmic deeds. For example, contemplation of the infinite compassion of Buddha, as one makes one's way to Shwedagon's great stupa, is a good karmic deed. The pilgrim, on his way up the steps of the pagoda, buys flowers, candles, coloured flags and streamers. They are to be offered in honour of the great stupa wherein are enshrined the relics of Buddha. This act is the act of dana, or giving, an important aspect of Buddhist teaching. The donation boxes around the pagoda receive offerings large and small, given to the pagoda for general purposes. All donations are voluntary, from the smallest coin put into the box to the priceless jewels hung on the top of the pagoda. No fees are ever requested at pagoda for use of the lifts or for the minding of footwear. The pilgrim can make whatever donation he chooses and may even make none if he wishes. Rudyard Kipling described his 1889 visit to Shwedagon Pagoda ten years later in From Sea to Sea and Other Sketches-- Letters of Travel vol. 1 (1899). See External Links below for full text. In 1608 the Portuguese adventurer Philip de Brito e Nicote, known as Nga Zinka to the Burmese, plundered the Shwedagon and took the 30-ton bell donated in 1485 by King Dhammazedi who succeeded Shin Sawbu. De Brito's intention was to melt the bell down to make cannons, but when he carried it across the Bago River it dropped into the river never to be recovered. Two centuries later when the British landed on May 11, 1824 during the First Anglo-Burmese War, they immediately seized and occupied the Shwedagon, seeing it as a fortress in a commanding position over the city, and the stupa remained as such until they left two years later. There was pillaging and vandalism, and one officer's excuse for digging a tunnel into the depths of the stupa was to find out if it could be used as a gunpowder magazine. The Maha Gandha (lit. great sweet sound) Bell, a 23-ton bronze bell cast in 1779 and donated by King Singu and popularly known as the Singu Min Bell, was carried off with the intention to ship it to Calcutta. It met the same fate as the Dhammazedi Bell and fell into the river. When the British failed in their attempts to recover it, the people offered to help provided it could be restored to the stupa. The British, thinking it would be in vain, agreed, upon which divers went in to tie hundreds of bamboo poles underneath the bell and floated it to the surface. There has been much confusion over this bell and the 42-ton Maha Tissada (three-toned) Gandha Bell donated in 1841 by King Tharrawaddy along with 20 kg of gold plating; this massive ornate bell - only the Mingun Bell is larger than this - hangs in its pavilion in the northeast corner of the stupa. A different but less plausible version of the account of the Singu Min Bell was given by Lt. J.E.Alexander in 1827. This bell can be seen hung in another pavilion in the northwest of the pagoda platform. The Second Anglo-Burmese War saw the British re-occupation of the Shwedagon in April 1852, only this time the stupa was to remain under their military control for 77 years until 1929, although the people were given access to the Paya. In 1920, students from Burma's only university met at a pavilion on the southwest corner of the Shwedagon pagoda and planned a protest strike against the new University Act which they believed would only benefit the elite and perpetuate colonial rule. This place is now commemorated by a memorial. 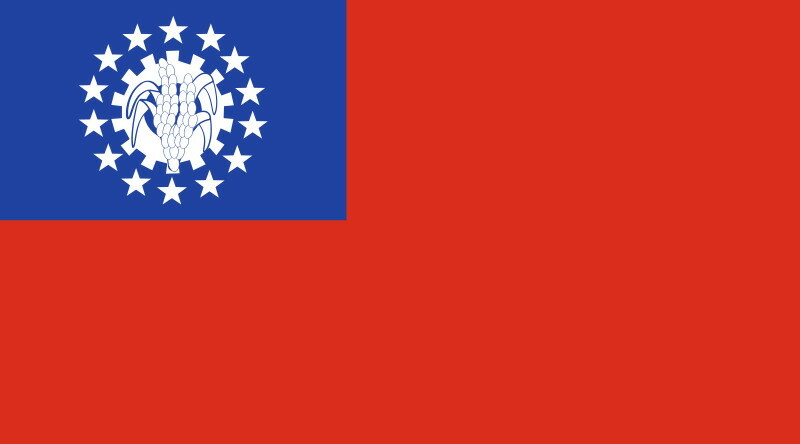 The result of the ensuing University Boycott was the establishment of ‘national schools’ financed and run by the Burmese people; this day has been commemorated as the Burmese National Day since. During the second university students strike in history of 1936, the terraces of the Shwedagon were again where the student strikers camped out. In 1938, oilfield workers on strike hiked all the way from the oilfields of Chauk and Yenangyaung in central Burma to Rangoon to establish a strike camp at the Shwedagon Pagoda. This strike, supported by the public as well as students and came to be known as the '1300 Revolution' after the Burmese calendar year, was broken up by the police who, in their boots whereas Burmese would remove their shoes in pagoda precincts, raided the strike camps on the pagoda. The ‘shoe question’ on the pagoda has always been a sensitive issue to the Burmese people since colonial times. The Burmese people had always removed shoes at all Buddhist pagodas. Hiram Cox, the British envoy to the Burmese Court, in 1796, observed the tradition by not visiting the pagoda rather than take off his shoes. However, after the annexation lower Burma, European visitors as well as troops posted at the pagoda openly flouted the tradition. It was not until 1919 that the British authorities finally issued a regulation prohibiting footwear in the precincts of the pagoda. However, they put in an exception that employees of the government on official business were allowed footwear. The regulation and its exception clause moved to stir up the people and played a role in the beginnings of the nationalist movement. Today, no footwear or socks are allowed on the pagoda. In January 1946, General Aung San addressed a mass meeting at the stupa, demanding ‘independence now’ from the British with a thinly veiled threat of a general strike and uprising. Forty-two years later, on August 26, 1988, his daughter, Aung San Suu Kyi addressed another mass meeting of 500,000 people at the stupa, demanding democracy from the military regime and calling the 8888 Uprising the second struggle for independence. On September 26, 2007, Clashes between security forces and thousands of protesters led by Buddhist monks in Burma have left at least five protesters dead by Burma security forces, according to opposition reports, in an anticipated crackdown. Earlier in the day security authorities used tear gas, warning shots and force to break up a peaceful demonstration by scores of monks gathered around the Shwedagon Pagoda. The Web site reports that protesting ‘monks were beaten and bundled into waiting army trucks,’ adding about 50 monks were arrested and taken to undisclosed locations. In addition, the opposition said ‘soldiers with assault rifles have sealed off sacred Buddhist monasteries ... as well as other flashpoints of anti-government protests.’ It reports that the violent crackdown came as about 100 monks defied a ban by venturing into a cordoned-off area around the Shwedagon Pagoda, Burma's holiest Buddhist shrine. It says that authorities ordered the crowd to disperse, but witnesses said the monks sat down and began praying, defying the military government's ban on public assembly. Security forces at the pagoda ‘struck out at demonstrators’ and attacked ‘several hundred other monks and supporters,’ the opposition Web site detailed. Monks were ushered away by authorities and loaded into waiting trucks while several hundred onlookers watched, witnesses said. Some managed to escape and headed towards the Sule Pagoda, a Buddhist monument and landmark located in Yangon's city center. 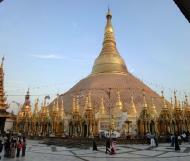 Shwedagon Pagoda is the most popular and well-known pagoda in Yangon. The pagoda is one of the main tourist destinations in Myanmar. Located at No.1, Shwedagon Pagoda Road, Dagon Township, in Yangon, this pagoda is the most notable building in Yangon. The Shwedagon Pagoda is a great cone-shaped Buddhist monument that crowns a hill about one mile north of the Cantonment. The pagoda itself is a solid brick stupa (Buddhist reliquary) that is completely covered with gold. It rises 326 feet (99 m) on a hill 168 feet (51 m) above the city. The perimeter of the base of the Pagoda is 1,420 fee and its height 326 feet above the platform. The base is surrounded by 64 small pagodas with four larger, one in the center of each side. There also are 4 sphinxes, one at each corner with 6 leogryphs, 3 on each side of them. Projecting beyond the base of the Pagoda, one on the center of each side are Tazaungs in which are images of the Buddha and where offerings are made. There are also figures of elephants crouching and men kneeling, and pedestals for offerings all around the base. In front of the 72 shrines surrounding the base of the Pagoda, you will find in several places images of lions, serpents, ogres, yogis, spirits, or Wathundari. On the wall below the first terrace of the Pagoda at the West-Southern Ward and West-Northern Ward corners, you will see embossed figures. The former represents King Okkalapa who first built the Pagoda. The latter is a pair of figures; the one above represents Sakka who assisted in foundation of the Pagoda, and the one below, Me Lamu, consort of Sakka and mother of Okkalapa. There are 4 entrances leading into the base of this great Shwedagon Pagoda. No one is sure what is inside. According to some legendary tales, there are flying and turning swords that never stop, which protect the pagoda from intruders; some says there are even underground tunnels that leads to Bagan and Thailand. There also are 4 sphinxes, one at each corner with 6 leogryphs, 3 on each side of them. Projecting beyond the base of the Pagoda, one on the cener of each side are Tazaungs in which are images of the Buddha and where offerings are made. There are also figures of elephants crouching and men kneeling, and pedestals for offerings all around the base. In front of the 72 shrines surrounding the base of the Pagoda, you will find in several places images of lions, serpents, ogres, yogis, spirits, or Wathundari (Recording Secretary Angel). On the wall below the first terrace of the Pagoda at the WSW and WNW corners, you will see embossed figures. The former represents King Okkalapa who first built the Pagoda. The latter is a pair of figures; the one above represents Sakka who assisted in foundation of the Pagoda, and the one below, Me Lamu, consort of Sakka and mother of Okkalapa. There are 4 entrances leading into the base of this great Shwe Dagon Pagoda. No one is sure what is inside. According to some legendary tales, there are flying and turning swords that never stop, which protect the pagoda from intruders; some says there are even underground tunnels that leads to Bagan and Thailand! Legend has it that Tapussa and Bhallika brought the original sacred hairs of Buddha from India across the ocean. On their way to Myanmar, the two brothers were relieved of 2 hairs by the King of Ajetta, and 2 more were robbed by the King of Nagas, who transformed himself into the likness of a human being and boarded the ship at night. On arrival in Myanmar, a great festival was celebrated in honour of the sacred hairs for several days. Sakka, Lord of the Heaven, came down to earth and assisted in the selection of the site; but he had to invoke the aid of the 4 apirits: Sule, Amyitha, Yawhani, and Dakkhina. Up to the 14th century, not much was known of the Pagoda. In AD 1372, Binnya U, King of Hantharwaddy (Bago) visited Yangon in state the repaired the Pagoda. Successive Kings of Myanmar repaired or re-gilt it till the Shwe Dagon reached its present size some 5 centuries ago. The little town of Okkala has since grown into the city of Yangopn, but it has no greater glory than the gleaming golden shrine, the spire of which rises majetically into the sky as if conscious of the veneration which the pagoda invokes. The Shwe Dagon apparently begain to assume its importance as a place of religious verneation during the years of the Mon Kingdom of Bago roughly coinciding with the reigns of Binnya U, Binnya Dammayaza, Binnyaran, Binnyawaru, and Binnyagyan. But it was in the time of Queen Shin Sawpu that it first assumed something of its present shape and appearance. Shinsawpu, Queen Regnant of Hantharwaddy, during 1455-62 improved the pagoda, for which she built the terrace, the great balustrade and the several encircling walls, and dedicated a vast area of blebe lands. She gilded the pagoda from top to bottom with gold leaves equal to her body weight. She set up a town on the northwest of the pagoda in the locality now known as Myenigone, so that she might supervise all the works of merit at the pagoda. Her brother and immediate predecessor Binnyagyan had raised the pagoda to to a height of 302 feet. King Dhamazedi, Shinsawpu's son-in-law and successor, erected inscriptions relating the legend of teh foundation of the pagoda. He also offered a great bell said to weigh 180,000 viss (648,000 lb) of bronze, which the Poruguese adventurer, Phillippe de Brito removed around 1608, so that he might cast the bronze into cannons. The great bell was named Dhamazedi Bell and it really is the largest bell in the whole world. But on the way to Than Lyin (Syriam), of which he was the lord, the boat bearing the great bell sank in the river. The Pagoda was reverenced by Bayinnaung, his son Nandabayin, Anaukpetlun, Minredeippa, and Tharlun. King Alaungphayar worshipped at the Shwe Dagon and embellished it by re-gilding. Shinbyushin, King of Ava, raised the pagoda to its present height in 1774 and made a new crown (Htee) for it gilding it with his own body weight in gold. King Singu, son of Sinbyushin, in 1778 regilt the pagoda again, and cast a bell which weighed 55,555 viss (~16 tons) of bronze. It stands at the north-west corner of the pagoda platform. After the First Anglo-Burman War of 1824, this bell was taken by the Prize Agents, but it sank to the bottom of the river and was refloated and replaced at the pagoda by the Myanmar public. King Tharrawaddy in 1841 set up a town on the west side of the pagoda, regilt it with 12 viss (~20 lb) of pure gold and cast a bell 26,000 viss (~40 tons). It stands at the north-east corner of the platform. King Mindon, who founded Mandalay in 1857, sent down a new golden crown by a steamer to Yangon in October 1871, when Lower Myanmar was already under the British rule. In 1919 there was an earthquake and the Trustees repaired the diamond bud, and vane and replaced them in two years later at a cost of a million rupees.